After a controversial decision to spend $150,000 on boulders to discourage homeless camping under I-90, City Council President Ben Stuckart has been caught between angry Spokanites on both sides. The front-page headline in today's Spokesman-Review announced a big, new proposal from City Council President Ben Stuckart: "Stuckart calls for homeless 'tent city', the headline read. "Council president now regrets using boulders on lot." Stuckart indeed regrets the decision to spend $150,000 on boulders underneath I-90 as a way to goad a homeless encampment to relocate — at least without a proper process. "The homeless citizens relocated from their community deserved an outstretched hand from their elected officials instead of a hammer and a bunch of rocks," Stuckart wrote Wednesday on Facebook. "For all of this, I am sorry." But Stuckart says he was frustrated by the way the Spokesman-Review portrayed the second claim, the one suggesting he was leading a charge for a tent city to be created. "I’m not calling for a tent city,” Stuckart clarifies. "I’m not saying let’s have tent cities all over the city." Instead, Stuckart says his point was a bit more nuanced: Not that a tent city should be created, but that a temporary tent city is an option available to homeless advocates. One that they can pursue, instead of just attacking the city for its decisions. "There’s an opportunity there for some private groups to get a 60-day tent city permitted," Stuckart says. "That's something we’ve always been willing to work on." During the past week, Stuckart has been hammered by many of his allies for his vote in support of spending money to install the boulders. "A whole group of people is literally calling me evil on Facebook, saying this is the worst thing that city has ever done," Stuckart says. "There’ s a group of citizens calling for my resignation." 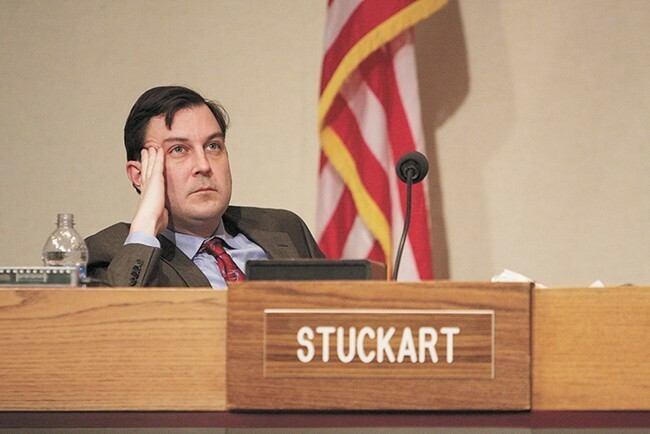 Stuckart agrees the city went about the decision the wrong way. "I think what we should have done is had this forum, to talk about all the issues we’re hearing about on both sides, to hash this out," he says. But he also expresses his frustration with some of those critics of the decisions. He argues that they need to invest in working for solutions they support. "You can’t just say, in a vacuum, you shouldn’t have put up the boulders, go screw yourself, and not talk about other solutions you can put your effort into," Stuckart says. That's why he was suggesting there was another avenue that groups concerned about the homeless could pursue, if they chose to do so. He says the encampments have imposed genuine challenges to surrounding businesses and parents of Lewis and Clark High School students. Stuckart says he's had friends from Lewis and Clark raise legitimate fears about walking through the area at night. He says he's seen how the encampment has resulted in people feeling like they're being approached and aggressively harassed at a nearby Taco Time. Meanwhile, in apologizing about the boulders, Stuckart says he earned himself a whole new set of critics, saying, "Hey, Ben, what the hell are you doing apologizing?" He points to the City of Spokane Forum on Homelessness, to be held at 6 pm at the Spokane City Council Chambers on Sept. 25, as a way to hash out some of the issues. "We need to do a lot more education for what’s out there," Stuckart says. "There’s clearly a divide in the community for what to do [for homeless people who are] not going to shelters. Nobody’s hearing each other at all." Stuckart says that more shelter space is necessary as well. "If every single person that is homeless went and tried to use the shelters, I think we’d still have a bit of a shortage," he says. In fact, shelters already have some trouble finding space for everyone who needs it. The Open Doors family shelter has had to turn people away most nights since opening for overnight stays in June, and Hope House women's shelter turns away about a dozen single women every night. House of Charity, currently open to single men and women 24 hours a day, has not yet turned people away, but has regularly filled up all sleeping mats. When that happens, people are still welcome to come inside, but may have to sit at tables and chairs to rest, says Sam Dompier, HOC director. Jonathan Mallahan, director of the city’s neighborhood and business services department, also has expressed frustration over the messages sent by the basalt boulders. The plan to install them was already in place as a maintenance tactic, he says, but the decision to install them sooner was made after businesses, and others who work and live near the freeway, complained about increasing impacts from camps there. “These improvements — while they did have the benefit of mitigating secondary impacts of camping on surrounding businesses — they needed to occur anyway, because it was terrible with weeds and dust, and it was not a good place to be,” Mallahan says. That said, Mallahan says he feels awful that people saw the installation of the boulders and assumed that the city doesn’t care for, or do anything to help, people experiencing homelessness. Mallahan says that he invites the public to engage with the city, which continues to invest in options for shelters, including a 24/7 shelter system and permanent supportive housing options. “I want your readers to know that, whereas the basalt wasn’t thoughtless, wasn’t put down callously, I do understand the impact that had, and what the reaction was,” Mallahan says.